Points clouds from UAVs have become a common sight. Cheap consumer drones equipped with cameras produce points from images with increasing quality as photogrammetry software is improving. But vegetation is always a show stopper for point clouds generated from imagery data. Only an active sensing technique such as laser scanning can penetrate through the vegetation and generate points on the ground under the canopy of a forested area. Advances in UAV technology and the miniaturization of LiDAR systems have allowed lasers-scanning solutions for drones to enter the market. 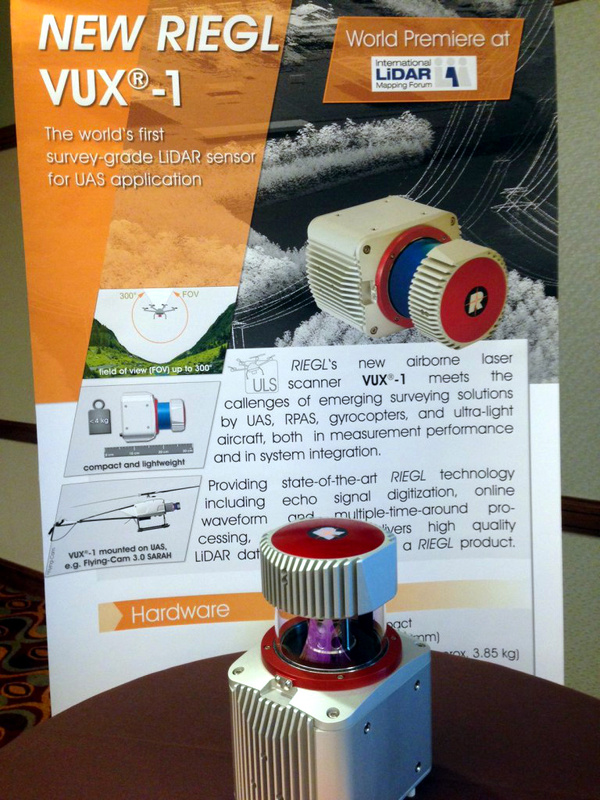 Last summer we attended the LiDAR for Drone 2017 Conference by YellowScan and processed some data sets flown with their Surveyor system that is built around the Velodyne VLP-16 Puck LiDAR scanner and the Applanix APX15 single board GNSS-Inertial solution. One common challenge observed in LiDAR data generated by the Velodyne Puck is that surfaces are not as “crisp” as those generated by other laser scanners. Flat and open terrain surfaces are described by a layer of points with a “thickness” of a few centimeter as you can see in the images below. This visualization uses a 10 meter by 5 meter cut-out of from this data set with the coordinate range [774280,774290) in x and [6279463,6279468) in y. Standard ground classification routines will “latch onto” the lowermost envelope of these thick point layers and therefore produce a sub-optimal Digital Terrain Model (DTM). Triangulation of all last returns of mostly flat 10 meter by 5 meter area. Points are colored by flightline ID. Zooming shows the vertical spread of the points. Points are colored by flightline ID. Zooming further in and pink like with length of 8 cm for scale. Points are colored by flightline ID. In part this “thickness” can be reduced by using fewer flightlines as the “thickness” of each flightline by itself is lower but it is compounded when merging all flightlines together. However, deciding which (subset of) flightlines to use for which part of the scene to generate the best possible ground model is not an obvious tasks either and even per flightline there will be a remaining “thickness” to deal with as can be seen in the following set of images. All returns from flightline 1 triangulated. All returns from flightline 2 triangulated. All returns from flightline 4 triangulated. All returns from flightline 5 triangulated. All returns from flightline 6 triangulated. All returns from all flightlines triangulated. Once you decompress the RAR file (e.g. with the UnRar.exe freeware) you will find six raw flight strips in LAS format and the trajectory of the UAV in ASCII text format as it was provided by YellowScan. As usually we start with quality checking by visual inspection with lasview and by creating a textual report with lasinfo. The raw LAS file “Flaugergues_test_demo_ppk_L1.las” colored by elevation. Nicely visible are the circular scanning patterns of the Velodyne VLP-16 Puck. We also notice that the trajectory of the UAV can be seen in the lasview visualization because the Puck was scanning the drone’s own landing gear. The lasinfo report tells us that point coordinates are stored with too much resolution (mm) and that points do not need to be stored using point type 3 (with RGB colors) because all RGB values are zero. We fix this with an initial run of las2las and also compress the raw strips to the LAZ format on 4 CPUs in parallel. Next we do the usual check for flightline alignment with lasoverlap (README) which we consider to be by far the most important quality check. We compare the lowest elevation from different flightline per 25 cm by 25cm cell in all overlap areas. We consider a vertical difference of up to 5 cm as acceptable (color coded as white) and mark differences of over 30 cm (color coded as saturated red or blue). Color codes number of overlapping flightlines. Color codes vertical difference between flightlines. The vertical difference in open areas between the flightlines is slightly above 5 cm which we consider acceptable in this example. Depending on the application we recommend to investigate further where these differences come from and what consequences they may have for post processing. We also create a color-coded visualization of the last return density per 25 cm by 25 cm cell using lasgrid (README) with blue meaning less than 100 returns per square meter and red meaning more than 4000 returns per square meter. As usual we start the LiDAR processing by reorganizing the flightlines into square tiles. Because of the variability in the density that is evident in the visualization above we use lastile (README) to create an adaptive tiling that starts with 200 m by 200 m tiles and then iterate to refine those tiles with over 10 million points down to smaller 25 m by 25 m tiles. Subsequent processing is faster when the points have a spatially coherent order. Therefore we rearrange the points into standard space-filling z-order using a call to lassort (README). We run this in parallel on as many cores as it makes sense (i.e. not using more cores than there are physical CPUs). Next we classify those points as noise that are isolated on a 3D grid of 1 meter cell size using lasnoise. See the README file of lasnoise for a description on the exact manner in which the isolated points are classified. We do this to eliminate low noise points that would otherwise cause trouble in the subsequent processing. Next we mark the subset of lowest points on a 2D grid of 10 cm cell size with classification code 8 using lasthin (README) while ignoring the noise points with classification code 7 that were marked as noise in the previous step. Considering only the resulting points marked with classification 8 we then create a temporary ground classification that we refer to as the “lowest ground”. For this we run lasground (README) with a set of suitable parameters that were found by experimentation on two of the most complex tiles from the center of the survey. We then “thicken” this “lowest ground” by classifying all points that are between 2 cm below and 15 cm above the lowest ground to a temporary classification code 6 using the lasheight (README) tool. Depending on the spread of points in your data set you may want to tighten this range accordingly, for example when processing the flightlines acquired by the Velodyne Puck individually. We picked our range based on the visual experiments with “drop lines” and “rise lines” in the lasview viewer that are shown in images above. Lowest ground points triangulated. Other points colored by flightline ID. Thick ground points in orange. Other points in black. Zoom on lowest ground point triangulation. Other points colored by flightline ID. The final ground classification is obtained by creating the “median ground” from the “thick ground”. This uses a brand-new option in the lasthin (README) tool of LAStools. The new ‘-percentile 50 10’ option selects the point that is closest to the specified percentile of 50 of all point elevations within a grid cell of a specified size given there are at least 10 points in that cell. The selected point either survives the thinning operation or gets marked with a specified classification code or flag. We now compare a triangulation of the median ground points with a triangulation of the highest and the lowest points per 10 cm by 10 cm cell to demonstrate that – at least in open areas – we really have computed a median ground surface. Triangulating median ground returns into a TIN. Triangulating lowest returns on 10 cm by 10 cm grid into a TIN. Triangulating highest returns on 10 cm by 10 cm grid into a TIN. Comparing triangulation of median ground points to lowest returns on a 10 cm by 10 cm grid with 5 cm rise lines. Comparing triangulation of median ground points to highest returns on a 10 cm by 10 cm grid with 5 cm drop lines. Finally we raster the tiles with the las2dem (README) tool onto binary elevation grids in BIL format. Here we make the resolution dependent on the tile size, giving the 25 meter and 50 meter tiles the highest resolution of 10 cm and rasterize the 100 meter and 200 meter tiles at 20 cm and 40 cm respectively. Because all LAStools can read BIL files via on the fly conversion from rasters to points we can visually inspect the resulting elevation rasters with the lasview (README) tool. By adding the ‘-faf’ or ‘files_are_flightlines’ argument we treat the BIL files as if they were different flightlines which allows us to assign different color to points from different files to better inspect the transitions between tiles. The ‘-points 10000000’ argument instructs lasview to load up to 10 million points into memory instead of the default 5 million. Final raster tiles in BIL format of three different sizes form seamless DTM. For visual comparison we also produce a DSM and create hillshades. Note that the workflow for DSM creation shown below produces a “highest DSM” that will always be a few centimeter above the “median DTM”. This will be noticeable only in open areas of the terrain where the DSM and the DTM should coincide and their elevation should be identical. We thank YellowScan for challenging us to process their drone LiDAR with LAStools in order to present results at their LiDAR for Drone 2017 Conference and for sharing several example data sets with us, including the one used here. Some specs below, but no details yet on power-consumption. 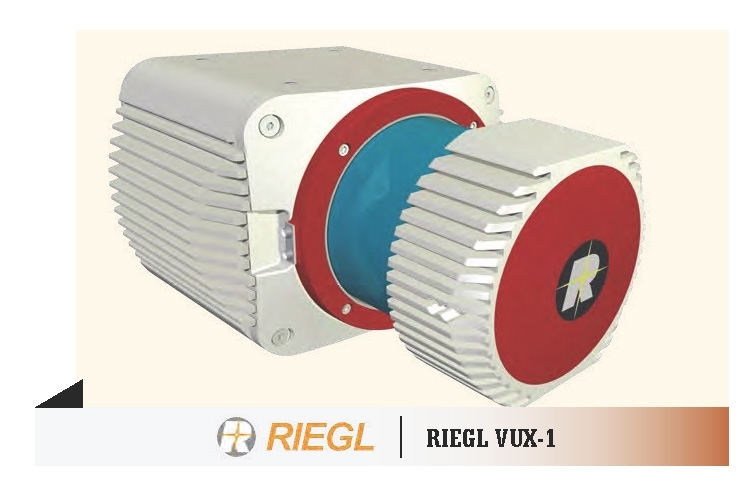 Below a proof-of-concept concept video by Phoenix Aerial on how such a system (here based on a Velodyne HDL-32E scanner) may look and operate. 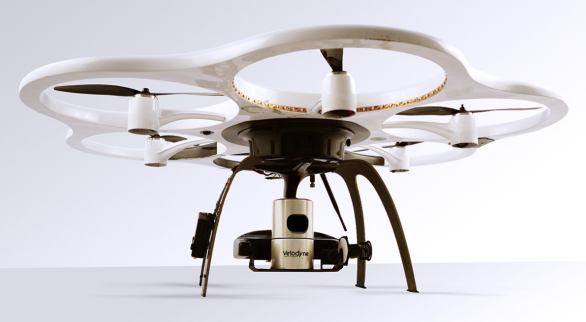 A similar system introduced by Airbotix is shown below. UPDATE (February 17th): Today the new VUX-1 finally made it’s much anticipated world-premiere during ILMF 2014 in Denver. 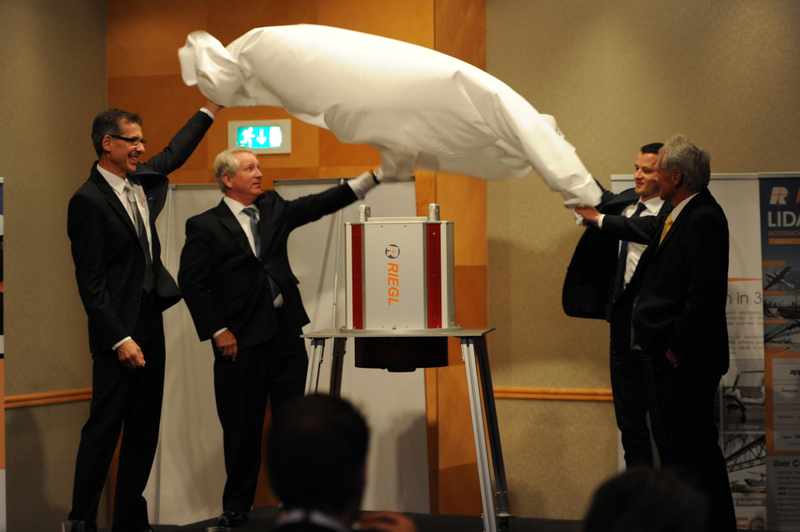 For more images of the official unveiling see RIEGL’s blog. 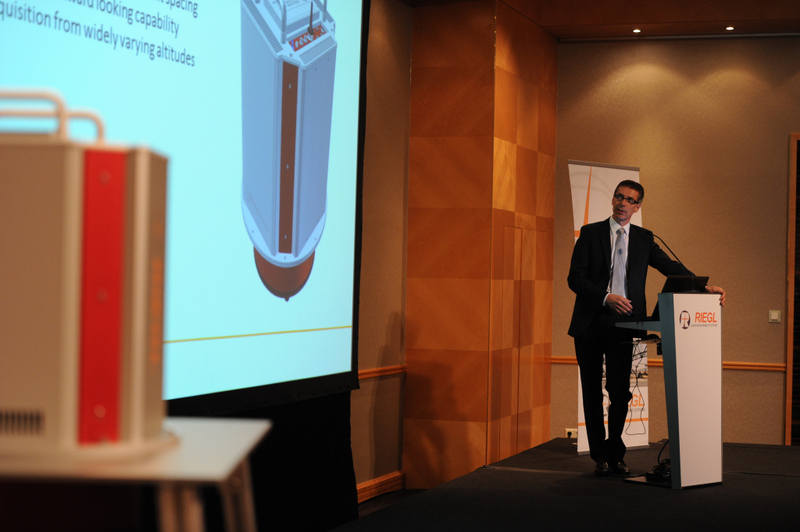 The VUX-1 LiDAR scanner for UAVs unveiled at ILMF 2014.